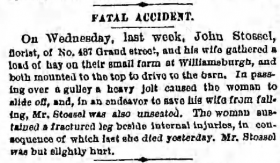 The Newtown Register (New York, New York) · June 23, 1881. 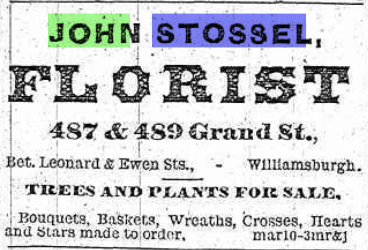 In the mid-1870s, Stossel began to garner publicity in the local press, but not for the best reasons. On August 18, 1875, the Brooklyn Daily Eagle reported that he, “with a long dagger of antique make, threatened the lives of his wife and other members of his household.” The dagger was a highly prized family relic that belonged to a friend of Stoessel’s, whose family had received it from a German king 600 years earlier. In the weeks that followed, Stossel was committed at the Flatbush Asylum for the Insane, where he remained for the next six months. Towards the beginning of 1876, he had a six-week-long stint at the Asylum for the Insane at Flushing. The Brooklyn Daily Eagle (Brooklyn, Kings, New York) · April 12, 1876. Drama seemed to follow the 104 Powers Street property. 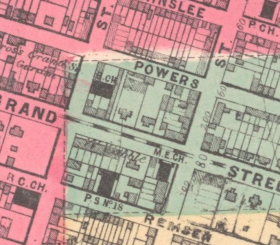 In 1887, the church found itself in the middle of a scuffle between its pastor, the Rev. George Mooney and his congregants. 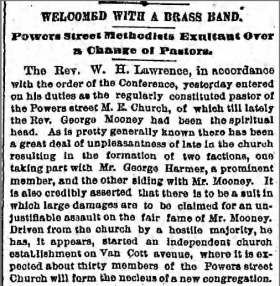 On April 18, 1887, the Eagle described this as “a great deal of unpleasantness” that resulted in the formation of two factions among the church’s congregants: one supported George Harmer, a prominent member of the congregation, and the other stood with Mooney. 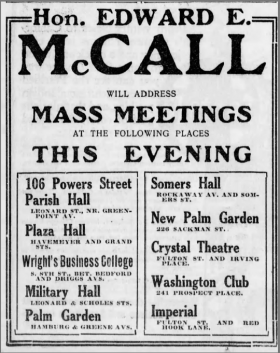 Driven away from the church by a “hostile majority,” Mooney started his own independent congregation on Van Cott Avenue in Greenpoint. The Brooklyn Daily Eagle (Brooklyn, Kings, New York) · April 18, 1887. When the church wasn’t caught up in drama, it was the site of a number of child marriages. In April 1892, in a story the Eagle described as a “pretty romance,” Harry C. Lovejoy, the 18-year-old son of wealthy Lorenzo W. Lovejoy, married 14-year-old Lottie C. Walsh—“one of the prettiest girls in Grammar School No. 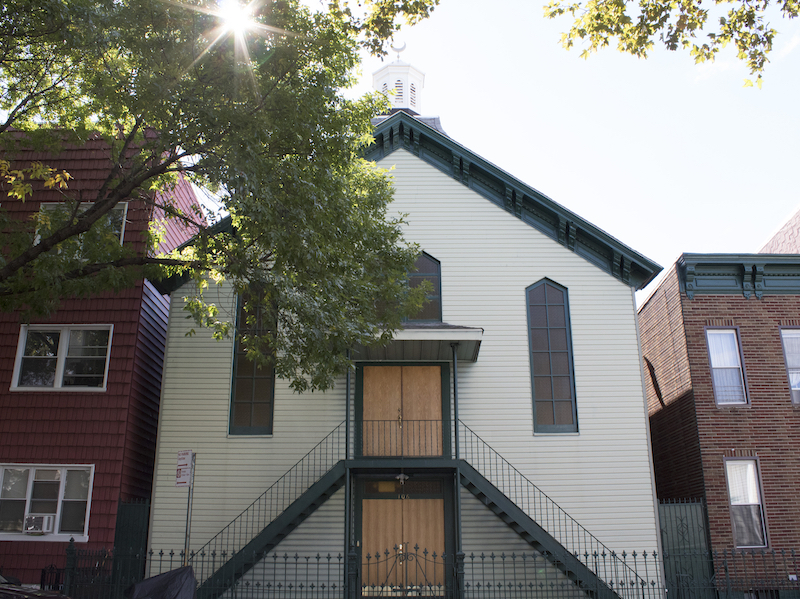 8, Brooklyn.” The wedding took place at the Powers Street church, much to the chagrin of his father. Harry and Lottie lied to the pastor, Rev. Nathan Hubbell; Harry claimed he was 20, and Lottie said she was 17. Once Harry’s father found out that his teenage son had married, and stolen his best broadcloth suit, he had him arrested. It took a week for Lovejoy Sr.’s anger to cool and he forgave his son, enabling this release from jail. The couple remained married. The Brooklyn Daily Eagle (Brooklyn, Kings, New York) · Oct 30, 1913. 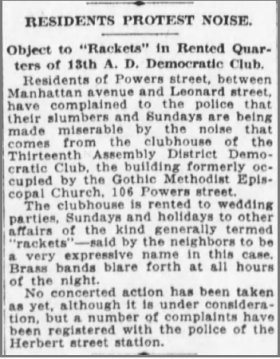 The Brooklyn Daily Eagle (Brooklyn, Kings, New York) · Jul 28, 1915. Quiet returned to the neighborhood when 104 Powers Street became, once again, a place of worship. This time, however, it wasn’t a church. 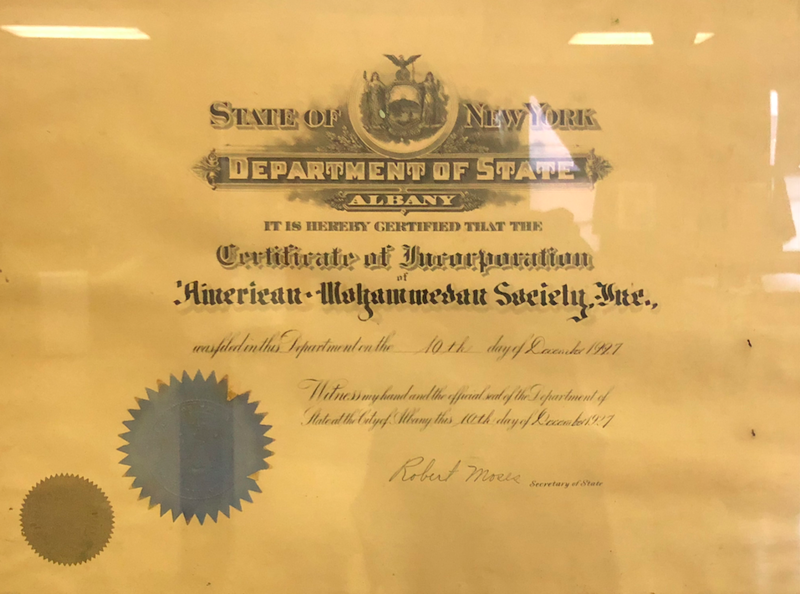 In 1931, the American Mohammedan Society, Inc. — an organization of Tatar Muslims from Lithuania, parts of Poland and Belarus — bought the property from the 13th Assembly District Realty Company, for the purposes of converting the property into a mosque. They filed alteration and plumbing and drainage permits between May and August of that year. 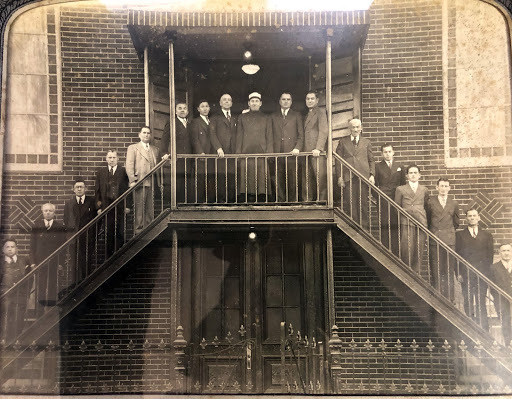 Founding members of the Powers Street mosque. Rafalowitz is in the center wearing the white cap. 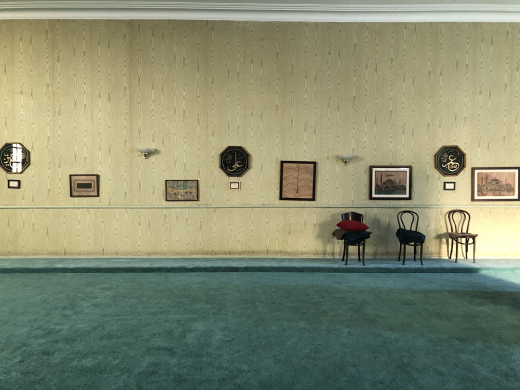 She then gestured towards a bunch of framed photographs on the wall — most of them are black-and-white, dating back to the 1940s and yellowing with age, a few are more recent. They’re of community picnics, brunches, get-togethers; grinning parents and grandparents standing behind a row of children sitting cross legged on the grass. “I was looking at these pictures one day and I found my grandmothers — dad’s mom and mum’s mom — sitting next to each other, before they were in-laws. This was a pretty close-knit community,” Ratkewitch said. Peering closely, she also located her aunt and uncle in one of the pictures. It was an amaizimg story about Muslim immigrants of Lipka Tatar descent. Tatar’s history was well presented. It looks like “Hijra never ends.” Resettling seems to be a part of our destiny. As Bosniaks from the Balkans, we have experienced similar hardships. 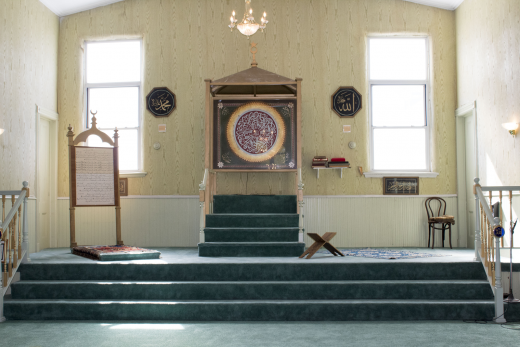 Try and stay connected with your mosque and community. I’m so pleased, Brooke, you brought this remarkable history to light. Thank you and please continue!